When you are hot, you can always turn up the heat up just a little more. The final professional golf major of the year, the PGA Championship, literally skipped to the final golfer. Rory McIlroy rallied to earn his second win at the PGA Championship. Hosted at the Jack Nicklaus designed Valhalla Golf Club in Louisville, Kentucky, 486 acres of bluegrass terrain was not enough for this nail-biting ending. The battle for the most lucrative purse of the four majors came down to three golfers who had a share of the lead on the back nine: Phil Mickelson, Rickie Fowler and McIlroy. It was pure theater; let’s get into the play-by-play. McIlroy, 10th hole from the fairway, his approach shot appears to go left, however it lands on the green setting up an eagle putt which he drains leaving him one off the lead. Mickelson on the 11th hole knocks down a birdie putt to tie with Fowler at 15 under. On the 12th hole, he drains a clutch par putt to keep his head above water and stay at 15 under. McIlroy, the current world number one, birdies the 13th hole. Fowler, who is tied for the lead, hits his tee shot right and I mean Republican right. He would bogey the hole. Mickelson’s par putt on the 16th hole is short to keep him tied with McIlroy for the lead. 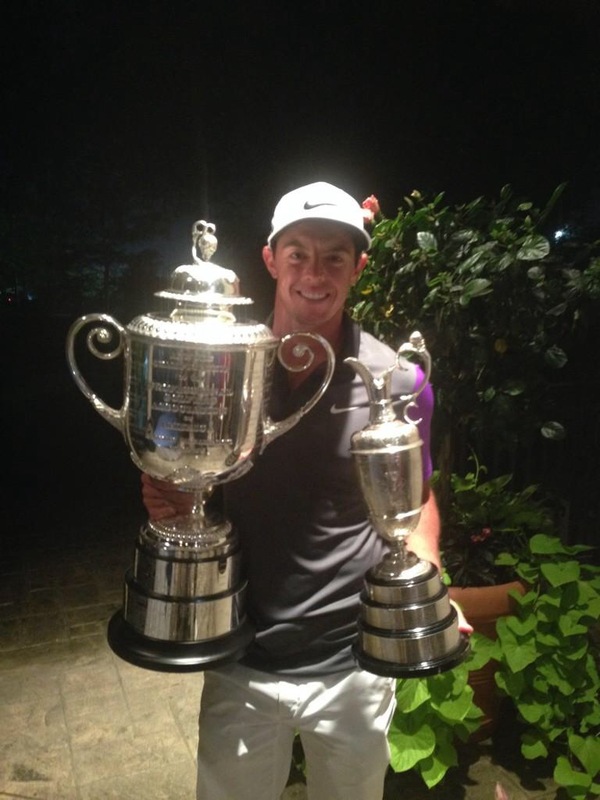 McIlroy won his first major at age 22 at the U.S. Open in 2011 proving he was built for moments like this. On the 17th hole out of the bunker, he glues it on to the green. From there the baby-faced Irish knew it was his major to win. He would birdie the hole for a two- shot lead. Darkness was setting upon Valhalla Golf Club. On the 18th hole, McIlroy was allowed to hit his tee shot before Mickelson and Fowler had reached their drives. Both were only two shots behind, still in the game. The tee shot lands just inches away from a hazard right of the fairway. Then the PGA of America allowed McIlroy to hit his second shot. “We were cool with hitting the tee shot,” Fowler said. “We weren’t expecting the approach shots.” Mickelson and Fowler had to stand to the side of the green. After the near-hazard shot, McIlroy ended up in the bunker. Mickelson needed a long and I mean Hail Mary long chip in to force a playoff, but he was inches short. He finishes second at 15 under and closed with a 66. “It was a fun day for me, to get in the mix, to make some birdies and move up early so that I had a good chance on the back nine, I’m disappointed in the outcome,” Mickelson said. He was runner-up for the ninth time in a major; only Arnold Palmer and Jack Nicklaus have more second-place finishes. It was his first top-ten finish on the PGA Tour this season. Fowler’s birdie shot on 18 lipped out, resulting in echoes of “yikes” from the entire gallery. He closed at 14 under with a 68, tied for third with Henrik Stenson, who fell out of a share of the lead by missing a three-foot par putt on the 14th hole. Stenson was 14 under and shot a 66. “This is probably the one that hurts the most for me, with the majors this year, the first three were a lot of fun to be in great positions and great finishes, this one I really felt like, I can go out today and win it,” Fowler stated. Fowler became the first player in history to finish in the top five at all four majors without winning one. McIlroy had to two-putt from 35 feet in the bunker for the win. He lagged the first one to tap-in range, and his fourth overall major win was his. “To win it in this fashion in this style, it means I know I can do it. I came from behind, I can mix it up with the best players down the stretch in a major and come out on top,” McIlroy stated. He became the first player to win consecutive majors since Pádraig Harrington did it in 2008. It was a soggy terrain this weekend in Louisville, however nothing was wet about the history McIlroy is making. He became only the fourth player in the past century to win four majors at age 25 or younger. The others were Tiger Woods, Jack Nicklaus and Bobby Jones, three of the game’s greatest players. He goes for the career grand slam next April at Augusta.